“Põhjala was founded in Tallinn, Estonia at the end of 2011 by four Estonian beer enthusiasts and home brewers. Soon thereafter the company was joined by a Scottish head brewer, Chris Pilkington, with a few years of Brewdog experience under his belt. 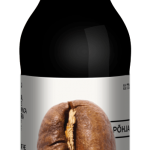 The first Põhjala beer, Öö Imperial Baltic Porter, was released in the beginning of 2013 and for most of that year, our beers were contract-brewed in other breweries’ production facilities while we prepared to open our own. Construction was completed in April 2014 and since then we’ve been brewing in our very own brewery in Tallinn’s Nõmme district. Starting out with 5 × 24-hl fermenters, we have more than quadrupled our annual production capacity in just 2.5 years. Since 2014, Põhjala has poured beers at many beer festivals around the world — from TCBW organized by us in Tallinn, to Cigar City’s Hunahpu’s Day in Tampa, Florida. We have collaborated with good friends from breweries like Boneyard, Brew By Numbers, De Struise, Lervig, Stillwater Artisanal and To Øl. Our own beers span a broad range of styles, but with a particular focus on porters, barrel ageing, and ingredients from the forests of Estonia — as well as more contemporary styles.